Jazz evolved from ragtime, an American style of syncopated instrumental music. Jazz first materialized in New Orleans, and is often distinguished by African American musical innovation. Multiple styles of the genre exist today from the dance-oriented music of the 1920s big band era to the experimental flair of modern avant-garde jazz. The radically new genre of music, originally seen as socially unacceptable, often called “the Devil’s music,” grew into an expression of high art, and as a result of many pioneering African American women. And while present from its inception, African American women are often omitted from the larger narrative in the history of the genre. Black women musicians fought harsh stereotypes levied against their gender, race, and musical abilities. Perhaps the most celebrated all-women jazz and dance bands, the International Sweethearts of Rhythm got its start as a fundraising effort for the Piney Woods Country Life School in Rankin County, Mississippi. Dependent upon contributions from benevolent societies, the school’s principal, Laurence C. Jones–the grandfather of communications mogul Cathy Hughes (Radio One, TV One)–organized the all-girl band to play local dances and parties to secure the finances of the institution. Of note, Jones also organized two other highly successful bands through the school–the Billboard-topping gospel group, The Five Blind Boys of Mississippi, and the Cotton Blossom Singers. Other all-women black jazz bands followed quickly, including the Prairie View Coeds, the Darlings of Rhythm, and Eddie Durham’s All-Star Girl Orchestra. However, as African American women took to the stage, they challenged both racist and sexist ideals that reflected the social and political landscape. Throughout the interwar years, between the end of the WWI and the beginning of the WWII, black women musicians and jazz bands complicated progressive beliefs about codes of respectability. The parlors and dancehalls where jazz performances occurred, as well as the lifestyle that accompanied such establishments (liquor, drugs, gambling, and prostitution) were often shunned as immoral places women should not frequent. Secondly, these women unpinned traditionally male-dominated spaces within entertainment, as women vocalists within all-men bands was common–but not women musicians. As a result, black women musicians were ridiculed in newspaper reviews as “mannish” and “incapable.” Lastly, women as band members challenged the classification of black women as either prostitutes or maids when outside of the domestic sphere. Jim Crow laws strictly forbade the performances of white women with black bands; however, as Sherrie Tucker notes in her book, Swing Shift: “All-Girl Bands of the 1940s, black women often did perform as musicians or singers with all-white bands because often the ire of white supremacy did not extend into spaces where white men were still in control. 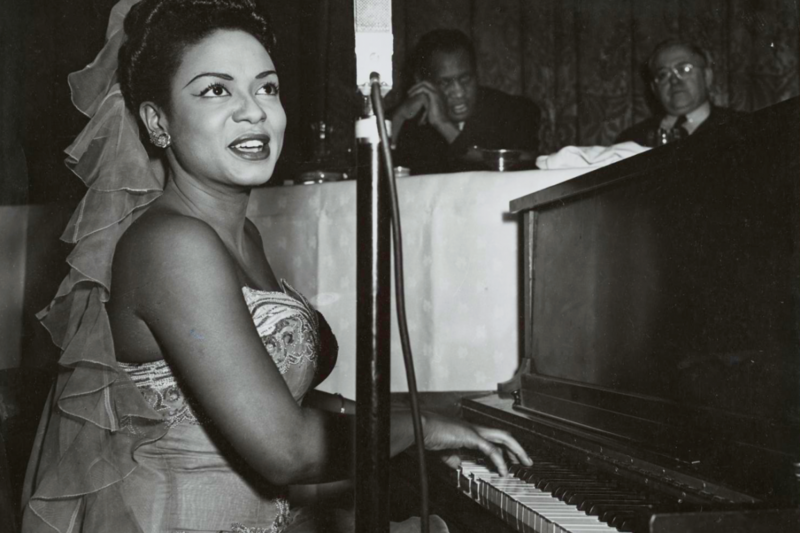 Performers like Mary Lou Williams, Emma “Ginger” Smock, Melba Liston, Lil Hardin Armstrong, and Vi Redd, set the stage by navigating sexist and racist terrain, achieving some degree of celebrity and paving the way for modern jazz musicians like Regina Carter, Teri Lyne Carrington, and Esperanza Spalding. Sherrie Tucker. Swing Shift: All Girl Bands of the 1940s. Duke University Press, May 23, 2001. D. Antoinette Handy. The International Sweethearts of Rhythm: The Ladies' Jazz Band from Piney Woods Country Life School. (Lanham, Md., Scarecrow Press) 1998. For more on the contributions of women to the African American story, see the Museum's #HiddenHerstory social media campaign.